Notice that the catalognr has "(O)" following it. Die-cut cover design, This double LP album includes the original thick paper custom inner sleeves with artwork and photos. 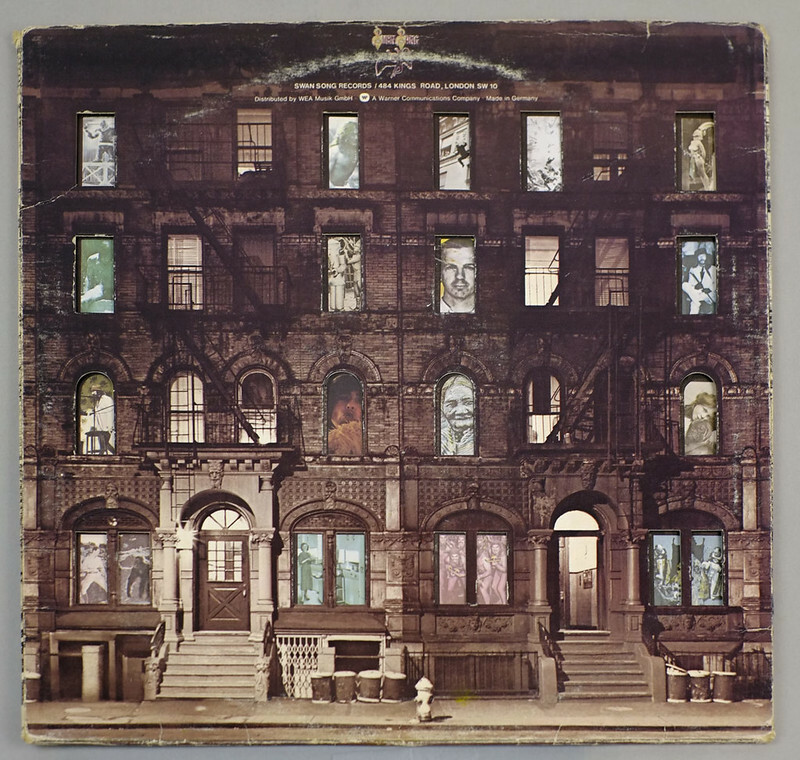 "Physical Graffiti" is the sixth studio album by the English rock band Led Zeppelin, released on 24 February 1975 as a double album. Recording sessions for the album were initially disrupted when bassist/keyboardist John Paul Jones considered leaving the band. After reuniting at Headley Grange, the band wrote and recorded eight songs, the combined length of which stretched the album beyond the typical length of an LP. 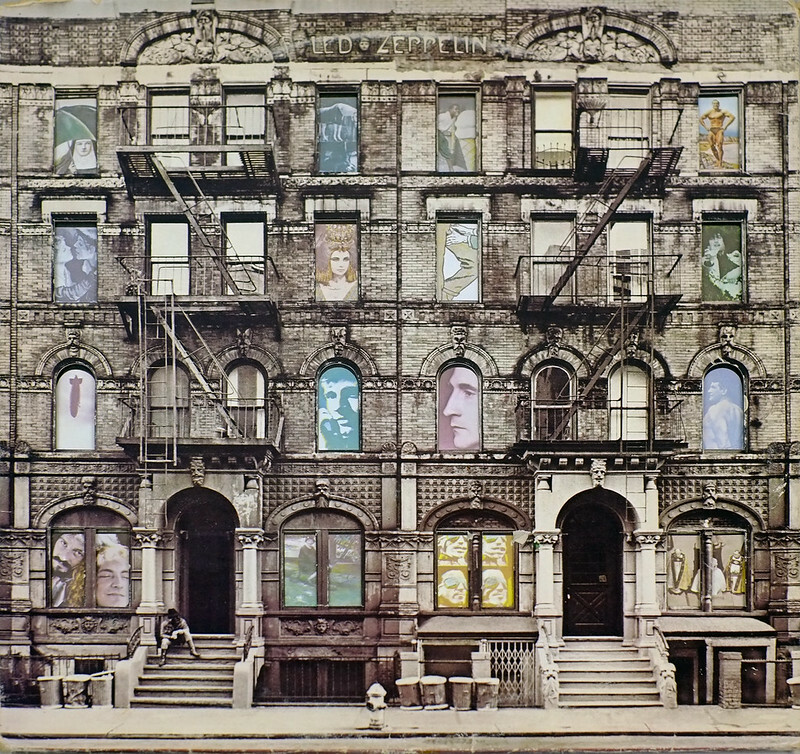 This prompted the band to make Physical Graffiti a double album by including previously unreleased tracks from earlier recording sessions. This double LP is packed in an album cover with die-cut "windows" showing people's portraits. It includes the two original custom inner sleeves (OIS) as well as the double page (poster-like) insert with tracklistings and production detailed information. The band-name "Led Zeppelin" is printed on the front cover, near the top-center. There is no album-title printed on the front cover. There is no catalognr on the front cover. There is NO bar-code on the album back cover. This album includes the original poster-like insert with track-listings and production information details. Near the top center of the record label is the "Swan Song" branding. There are NO label codes on the labels. The Rights Society "GEMA" boxed is left below the spindle hole. The catalognr on the record label is "SSK 89 400 (O)" with "(89 400 A) right below it. The rim-text runs from 9 o'clock to 3 o'clock and in printed in English and one of the lines ends with "MADE IN GERMANY"
Ron Nevison is an American record producer and audio engineer and has worked during the 1970s and 1980s on many hard rock and rock albums for bands like: Bad Company, Thin Lizzy, Ufo, Kiss , Heart , Ozzy Osbourne , Led Zeppelin and many others. Sound mix: Keith Harwood at Olympia Studios, London. Album cover photography: Elliot Erwitt, B.P. Fallen, Roy Harper Window Illustration Dave Hefferman. 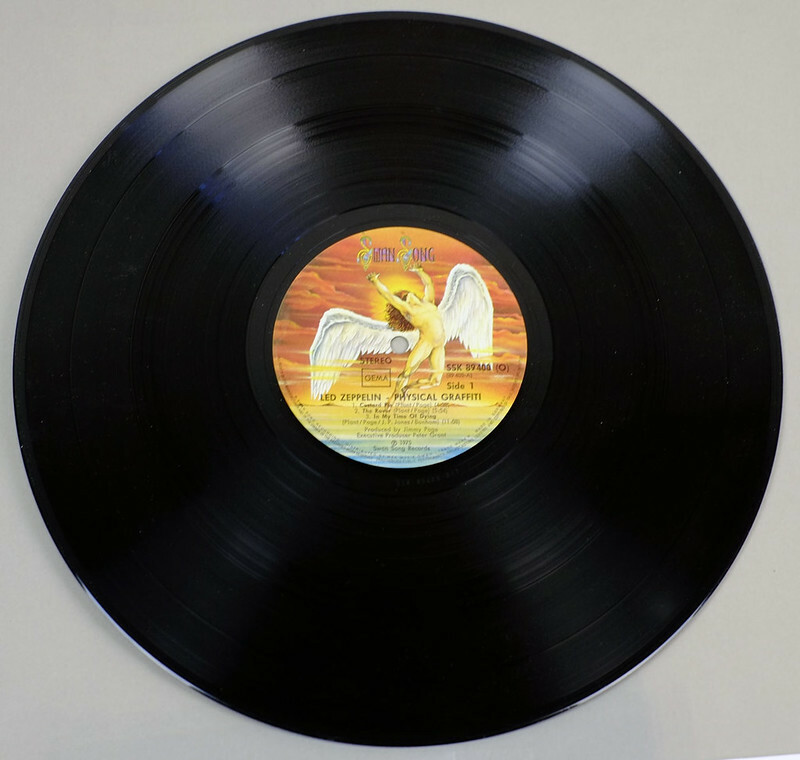 High Quality Photo of Album Front Cover "LED ZEPPELIN - Physical Graffiti"
Album Back Cover Photo of "LED ZEPPELIN - Physical Graffiti"
Complete Track-listing of the album "LED ZEPPELIN - Physical Graffiti"